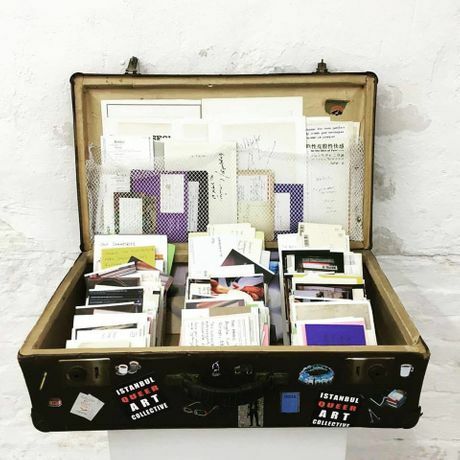 Curated by the Çukurcuma Collective, House of Wisdom explores the political power of books and libraries in our century, and is presented as a travelling exhibition/library that explores the increasing levels of censorship on information and the current sociopolitical situation in and around Turkey. Throughout centuries, libraries have been perceived as places where knowledge on life and space is organized, read, and interpreted, yet at certain times, their political significance are underestimated. Public libraries have been important symbols of political power and formation of cultural identity. They play a significant role in the political struggle for independence, as centres of democratic ideals, such as free access to cultural heritage and information. As public spaces, they are essential for bringing people together to share information, and they become even more important during times of collective resistance and protests for freedom. Curated by the Istanbul-based Çukurcuma Collective, House of Wisdom explores the political power of books and libraries in our century, and is presented as a travelling exhibition/library that explores the increasing levels of censorship on information and the current sociopolitical situation in and around Turkey. It started its journey in the non-profit art space, Dzialdov, Berlin. The show moved to Istanbul as part of the 15th Istanbul Biennial’s public program, and then to the art space Framer Framed in Amsterdam, as part of the Amsterdam Art Weekend 2017 programme. The exhibition and public programme of events now reside in Nottingham, with a panel discussion at Primary, in June 2018, followed by the exhibition here at Bonington Gallery, and other venues to be confirmed. This project is being run in collaboration with Queer Art Projects (London, UK), Nottingham Trent University’s Bonington Gallery, Primary, Bromley House Library, Nottingham UNESCO City of Literature, and Five Leaves Bookshop. If you would like to attend the preview event please RSVP at: boningtongallery@ntu.ac.uk to confirm your attendance.